Montana Chalks are environmentally friendly pigment sprays that are ideal for temporary outdoor markings or for indoor studio artwork. Great for events, advertisements, marketing campaigns or outdoor activities. Colors are deep-matte and high-covering and can be applied to sidewalks, walls, cardboard, or canvas. Markings can last from several days to weeks, depending on the surface, climate and weather conditions. 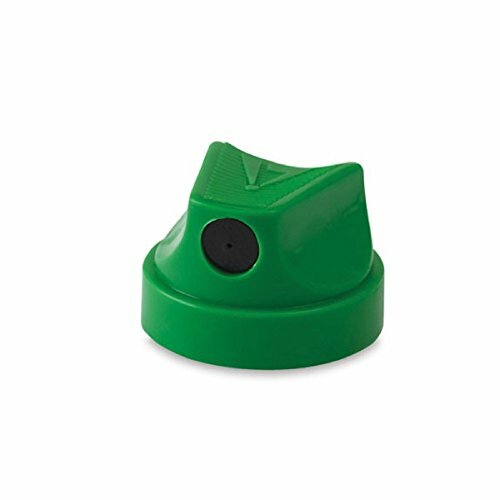 Non-hazardous to plants and can be used when landscaping or in the garden. Can be finished and sealed with spray varnish for permanent effects. Green chalk, 400ml can. Montana Acrylic Markers are water-based, pigmented, acrylic matte colors that match colors available in the Montana Gold spray paint cans. The paint is water-proof and abrasion proof - allowing application to almost any surface including canvas, wood, metal, and glass. Standard nib is 15mm and can be replaced. Montana Gold cans feature a level cap system with a variety of interchangeable caps that allow artists to customize spray width on the same spray can to achieve different effects for different projects. This set of 6 caps includes one of each of: Level 1- Ultra Skinny cap, Level 2- Fine Skinny cap, Level 3- Skinny Cap, Level 4- Soft Fat cap, Level 5- Fat cap, and Level 6- Ultra Fat cap. 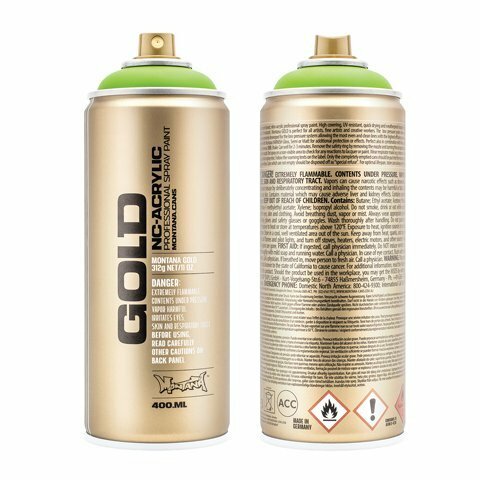 Montana Gold cans feature a level cap system with a variety of interchangeable caps that allow artists to customize spray width on the same spray can to achieve different effects for different projects. 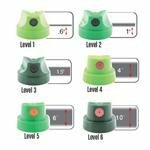 The Green Level Caps offer an easy-to-understand identification system based on shape and color. Skinny caps have an indented cap head and a black dot nozzle. The Green Level 2 Fine Skinny Cap can produce lines from .25 to 1 inch and is great for fine work and fine fading. 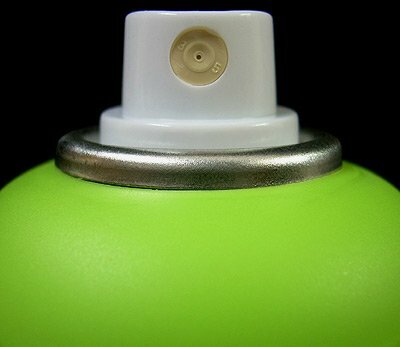 94 400-millilitre spray paint, matt finish 147 colors. 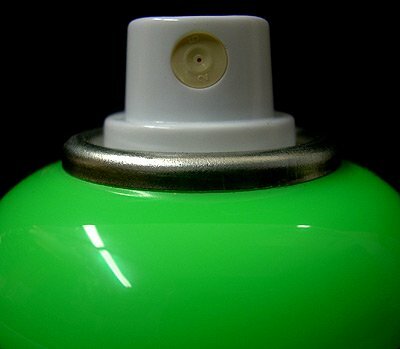 From the leader in spray paint quality and originator of spray made specifically for art. Montana aka MTN. 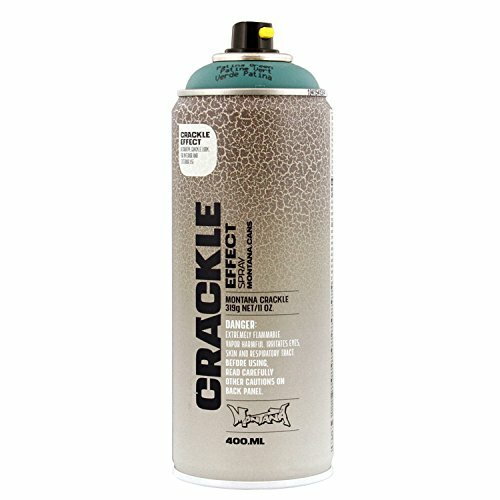 Montana Effect Crackle spray provides that great worn-in vintage look, in your choice of six colors. A base coat should be applied for the crackle lacquer to reveal, and should be allowed to dry for 45 minutes but no longer than 24 hours. High covering and can be top-coated when completely dry. 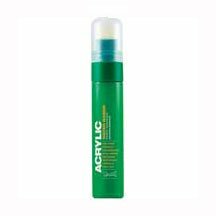 Can be used with Montana Gold sprays and Acrylic markers, as well as standard acrylic paints. Available in six colors. Patina Green, 400ml can.